The purpose of this paper is to extend the notion of well-posedness of fixed point problem for a mapping to a set of mappings. Also, we extend the property (E.A) known for two mappings to the general case of sets of mappings. Using weak compatibility and these new concepts, we prove a general common fixed point theorem for three self-mappings satisfying a general implicit relation and using the extended property (E.A) for which the fixed point problem is well posed. The intersection of two base rings associated to some transversal polymatroids is not necessary the base ring associated to a transversal polymatroid. In this paper, we compute the Hilbert series and the Hilbert function when the intersection of such base ring is the base ring associated to a transversal polymatroid. For a dynamic system with n degrees of freedom, the present paper proposes the following conjecture: the roots of the characteristic equation for a dynamic system with damping which satisfies the stability conditions (they give the specific pulsations with damping) have the same modulus as the roots of the specific equation without any damping (the specific pulsations of the system with no damping). This statement is proved for a dynamic system with one degree of freedom. In this paper we present our solution for improving the quality of communication in our particular desktop grid system, QADPZ, which consists of a dual communication mechanism. Thus, in order to improve the efficiency of communication, QADPZ support two different protocols (UDP and TCP/IP). To deal with the unreliability of UDP, an additional, more reliable level of communication has been added to the system, which works similarly with the real life postal service, delivering and receiving high-level message and implements a reliable, confirmation-based message exchange protocol. We point out that an unreliable transport mechanism that deals with packet loss gracefully and does not exhibit extreme losses can compete well with other more reliable transport protocols. 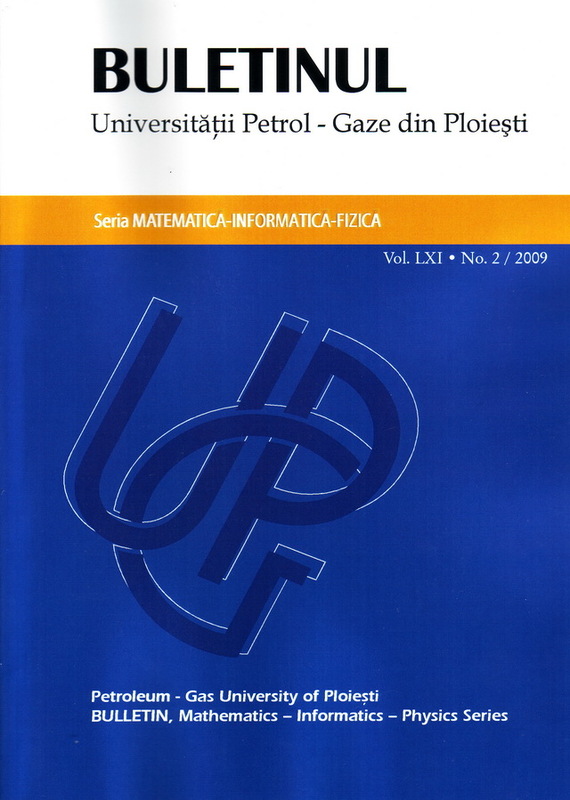 Informatics is one of the numerous specializations functioning within Petroleum-Gas University of Ploieşti that were founded during the last twenty years. Taking into account the prognosis of a continuous decrease of highschool graduates in the years to come, we consider that a better promotion of this specialisation is extremely important. This paper aims to draw a picture of the students in the first year attending Informatics, considering their marks at the disciplines included in the curriculum and the type of highschools they graduated from. In this article, there are presented the substitution tables used in cryptosystems (DES and AES) and their role in increasing the security of the cryptographic algorithms. The substituting tables are non-linear permutation functions and they are mathematically formalized using the Boolean functions. The easiest way to obtain new cryptographic algorithms is to use random S-boxes. The research directions are concentrated on the constructions of Boolean functions that have good cryptographic properties. Remote visualization techniques that use client-server environments allow users to access large datasets. One possible solution for remote visualization is the use of compression techniques, in which images are generated and compressed at the servers� side and then the encoded images are transferred over a data network, decompressed and displayed at the clients� side. In this paper we propose an adaptive algorithm based on reinforcement learning for choosing one of the available compression methods in order to maximize the frame rate. Our experiments show that such an algorithm can work in a dynamic and uncertain environment, consisting of a visualization server, a visualization client, and a network for transferring the compressed images between the server and the client. In order to improve the wastewater quality in accordance with the current European and Romanian standards, in Ploieşti it will be built a new wastewater treatment plant. The existing wastewater treatment plant has only the mechanical step, which it will be improved and extended with a biological and a sludge treatment step. In the present paper it is determined and analyzed the efficiency level of the existing mechanical step in the process of reducing the biochemical consumption of oxygen and removing the floating materials from the wastewater collected by the plant, using data mining techniques and fuzzy logic. A genetic algorithm is a time consuming technique, especially for the big complex problems. Therefore, any run-time optimization regarding applying the genetic operators is very useful, taking into account that these operators apply many times in every generation. In this paper we propose run-time efficient implementations for three well-known mutation operators, specific to the permutation encoding needed in the vast area of scheduling problems. These operators are: frame-shift, translocation and inversion. An essential condition to achieve the efficiency of an eLearning program is of software interoperability. The software interoperability has to be realized on two levels: syntactic level and semantic level. Two software applications can understand each other if they use the same terms or, in case they use different terms; they know the meanings of the terms. This desideratum can be achieved if the softwares use the same ontology or if there can be established a correspondence between their ontologies. In the present paper, there are approached the following subjects: the concept of ontology, techniques and software tools to build ontology, the educational ontologies and the problems related to ontology interoperability. In the present work a few expresions have been established in order to determine nanotubes subnanometer diameter type �armchair� and �zig-zag� proposing a different geometrical configuration than the one used to elaborate the polyhedral model in the speciality literature. The geometrical configuration proposed implies the mathematical demonstrations from the distorted graphene sheet,the cutting of the graphene sequence from the distorted network being made the same way as the conventional model. In this paper, using the electron-positron (e-p) plasma model for the physical vacuum, we study how to change the optical properties of vacuum in interaction with gravitational field.